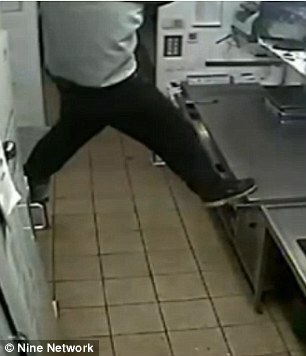 Thief breaks into Melbourne's Frankston Dandenong Take Away and takes keys to outside toilet. - DK Electrical & CCTV Langwarrin, Cranbourne, Carrum Downs & Frankston. You are here: Home / Blog / Thief breaks into Melbourne's Frankston Dandenong Take Away and takes keys to outside toilet. 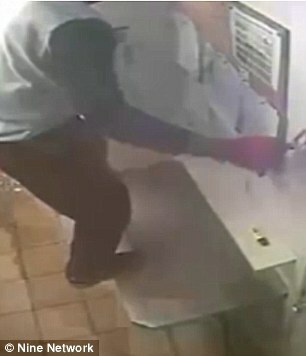 Thief breaks into Melbourne’s Frankston Dandenong Take Away and takes keys to outside toilet. A thief who broke into a fast food outlet fled with nothing more than keys to an outdoor toilet. CCTV footage shows the man dropping into Melbournea��s Frankston Dandenong store from the roof as cardboard boxes rain down around him. Despite going to the trouble of removing the roof tiles to break into the store, the man can be seen absconding as soon as he finds the bathroom keys hanging on the wall. Another pair of feet can be seen protruding from the roof, leading police to believe another man was involved in the burglary. Police have released the vision of the break in the hopes someone may recognise the man, whose face is clearly visible in the footage.